Mobile IP Communications for PDAs on Wireless Networks - VTGO defines the next generation in communications mobility. VTGO empowers users, allowing them to speak and move throughout a campus untethered - while simultaneously allowing them to browse the web, engage applications and access full unified messaging capabilities. 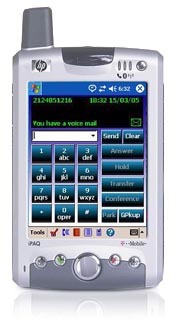 VTGO-PPC 2.3 is a softphone for the Cisco IP Telephony environment that will run on Windows Mobile 2003, WM5 and WM6. The application provides real-time voice communications on WiFi enabled Pocket PCs allowing simultaneously access to calendar, contacts and email applications. VTGO-PPC can stand-alone or be used as a mobility adjunct by supporting shared line appearances from hard-phone based extensions. Special support for the Motorola (Symbol) MC50/MC70, MC75A, Intermec CN3, HP 6300, and Fujitsu-Siemens Loox 720 devices has been implemented. Phone features include make/receive calls, hold/resume, transfer, conference, park/pick up/group pickup, voicemail, autoanswer, do-not-disturb, call forward, mute. Printable user guide - 86 pages - 3.93 MB - April 2011. Printable brochure - 4 pages - 218 KB - January 2007. Printable document - 12 pages - 109 KB - July 2007. Zipped project source code - 24 KB - July 2007. Zipped project source code - 10 KB - April 2010.